Need extra cash but can’t find a minute to spare? It’s a common struggle for busy parents trying to juggle work and family, but picking up a part-time job isn’t the only way to increase your household income. Here are three side gigs you can do on the weekends that don’t take away from your family time. More than 60 million American households own a dog, according to the Insurance Information Institute. That means there are probably dozens of dog owners within walking distance of your own home. Starting a dog-walking business is an excellent choice for boosting your income and your fitness, and your kids can come along too! If your kids are younger, stick to one dog at a time so you can keep an eye on your little ones. If you have children in their teens, try walking multiple dogs at once and get your kids to help! A typical charge for 30 minutes of dog walking is $15 to $25, making this a lucrative side gig on an hourly basis. Busy parents should target pet owners in their own neighborhood to maximize convenience and minimize transportation costs. Dropping in twice a day to feed and walk another person’s pet is an outdated form of pet sitting. These days, doting pet owners want their pets to receive lots of love and attention while they’re away, and the best way to get that is by boarding pets in someone else’s home. 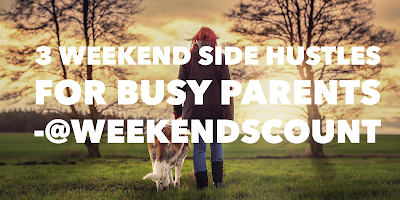 By positioning your house as a pet-friendly oasis, you can pick up pet sitting clients in need of weekend boarding while they head out of town. As a parent, you’ll love getting extra cash in your pocket without leaving home, and your kids will adore having a temporary playmate. In-home pet boarding fees start around $50 for dogs, but are less for cats. Prospective clients will want to see your facilities before committing, so set up your home to look inviting to pets. While many clients will provide their own pet beds and leashes, having basic supplies and toys on hand goes a long way toward impressing pet parents. When you’re already watching your own kids, it’s not much more work to add another child or two into the mix. If the other children are around the same age as your own, providing child care in your home is like getting paid to host a playdate. Busy parents can link up with other families in the neighborhood to provide weekend child care. Pitch yourself as a date night sitter, overnight care for kid-free mini-vacations, or a daytime sitter for young children when their older siblings are at weekend extracurriculars. Child care rates vary by location, but according to a 2016 study by UrbanSitter.com, the average rate is $15.71 per hour for one child. Busy parents can get started babysitting by offering their services to friends and acquaintances. Once you have a network of references, it’s easier to expand and reach new customers. There are a lot of gigs that can increase your income. But if you’ve ever tried to sit down at the computer on a Saturday afternoon when the kids are home, you know just how unrealistic many side gigs are for busy parents. These three options are not only kid-friendly, they’re also highly flexible so you can work as much or as little as you want and take time off when you need a family vacation of your own. Lucrative, flexible, and the kids can come along? Now that’s a side gig busy parents can work with. Eric Kelly blogs at MyDadventures.com.